At TNT Paintball we have two versions of paintball available for you. Both versions feature semi-automatic markers and are played on all of our six uniquely themed fields. Both versions are very similar, but there is a difference. Our Renter Only (.50 calibre paintball) has over the past few years become the more common paintball played at TNT Paintball. 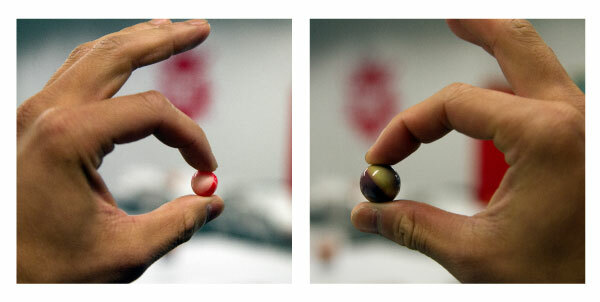 These games use slightly smaller, lighter markers and smaller paintballs with less mass. The paintballs are shot at approximately the same velocity as their .68 calibre counterparts, but due to the lower mass, carry less energy resulting in less impact force when meeting their target. 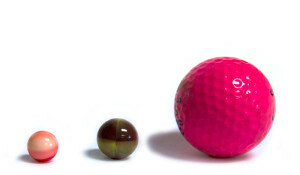 Most players still feel the impact of the smaller .50 calibre balls, but it is considerably less than our .68 calibre balls and at the end of the day go home with either no welts and bruises or considerably less welts and bruises than their .68 counterpart players. Again, as the name implies, our Renter Only (.50 calibre) games are limited to renters only. Most of the players have relatively little experience and everyone on the field uses the exact same rental gear, so it is a very even playing field. Our .68 calibre paintball features traditional sized paintballs; the same size paintballs that were used in the very first game of paintball back in 1981. These paintballs were developed for marking cattle and trees in the forest industry. The original paintballs had an oil paint fill and a player’s gear bag was not complete without a tin of turpentine. Luckily today, all paintballs used in our sport are without oil and wipe off and wash out of clothes quite easily. But the size of these paintballs has not changed and although cows and trees barely feel them, people on the other hand will usually feel them, especially when hit on bare skin. A .68 calibre paintball can leave a small welt or bruise. Part of the adrenaline rush that players get when they play paintball is knowing that if, or when, they get hit, they may feel the hit a bit. Our .68 calibre paintball option welcomes all players including players with their own gear, who oftentimes have at least some experience playing the game. The .68 calibre games are recommended for those who like a high adrenaline rush and aren’t afraid of a little discomfort when getting it. We recommend a minimum age of 12 years old, although as young as 10 can take part if parents feel their child can handle the additional discomfort associated with .68 calibre paintball hits. If you are unsure which version of paintball to choose, we recommend our Renter Only (.50 calibre) paintball for your first paintball experience. We guarantee you will have fun and experience has shown us that even the most timid players have no problem getting involved in the action very quickly in our .50 calibre version of paintball, which we cannot honestly say is always the case in our .68 calibre paintball option. In the end, it really depends on what kind of experience you are looking for. If you are looking for a high intensity, high adrenaline experience, choose our .68 calibre paintball. If you want some adrenaline, but mostly want to have fun without worrying about the discomfort, choose our Renter Only (.50 calibre) paintball.